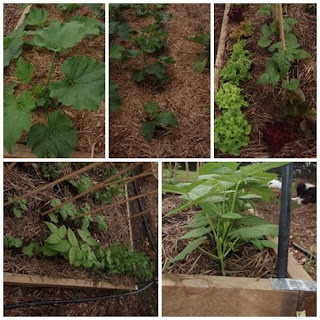 Our vegie patch is just loving the rain that we are having every few days. 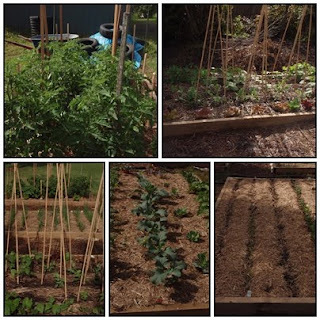 from top left is our tomatoes, legume bed,view from the legume bed to onion bed and tomato bed, brasica bed and root crops, this bed was mostly plated as seeds. From top left - zucchini, cucumbers, beans & lettuce, dwarf peas and beans, close up of a bean plant - this is very exciting as the beans and peas were the first seeds we planted. Our herb bed has gone quite wild with all this rain we have had. While I was trying to weed it out I found this little fellow watching me work, he was quite happy to sit in this large rhubarb leaf. What a lovely vege garden. You shouldn't be doing much shopping for veges once this starts producing. Love your natural pest disposal worker in the rhubarb :). I am jealous of your garden! Last year I grew tomatoes that grew WILD and were a huge bush but we benefited from it being so large. We also grew beans, and basil. This year I have been lazy and did NOTHING. But I did buy a lettuce plant which is growing bigger every day. I will definately have to make a better effort next year because I love eating fresh fruit and vegies from the garden! 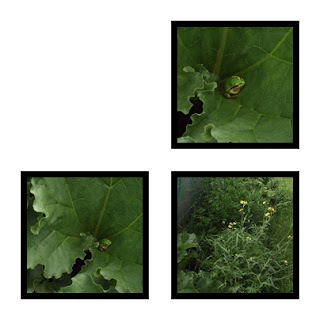 I love your rhubarb plant and love the little frog even more Gail...how special and you are lucky to have frogs in your lovely garden. Your garden is going great guns!!! Since the rain here, our silverbeet and rhubarb have gone crazy. Unfortunately I have not seen any frogs here for a loooong time. We have lizards which is probably a good sign, a a lot of earthworms. I had a " pet" green frog when I was a little girl, he used to climb/jump up about 20 steps to the landing of our Queensland home every night. verrry nice growth and great to look fwd too ! Thats a nice veg garden Gail. I'm thinking of growing a few diferent vegies in big pots,more manageable and not as much waste as there are only the two of us and there's only so much I can give to the relatives that live near us :) Barb.